IC-rated, Lithonia OneUp™ direct-wire downlights feature a unique “canless” design. These all-in-one LED fixtures include an integrated junction box for direct wiring and take less than 1/3 of the time to install versus a conventional incandescent can. 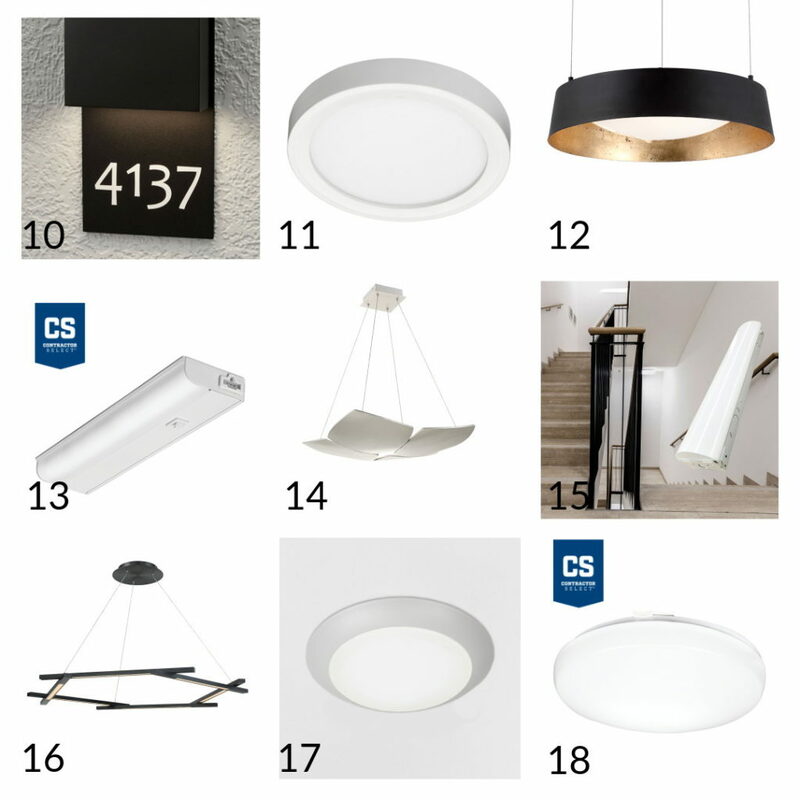 The design options of this fixture are plentiful, including: direction, round, square, and 4 colors; giving this fixture a high-end look with a budget price. Not quite a downlight....but so slim, it may fool you. This direct wire, damp location fixture is Energy Star® Rated and perfect to trim costs without sacrificing style. Used in closets and baths. This sleek ultra low profile design can be specifier from 12 to 36 inches. Die cast metal encaps and white acrylic ce-extruded housing make this a durable choice. Energy Star 2.0. Translucent Resin that can withstand the impact of a bowling ball, makes Lidea one of the most resilient fixtures on the market. This fixture is quality; from the impressive light engine to the 5 year shade warranty. Stepped pricing means the more fixtures on the project, the greater savings! When it comes to affordable and stylish, WAC pendants are a great place to start! The Copa pendant is aluminum construction and comes in white or black with gold or silver leaf interior. Can be mounted on a sloped ceiling. Perfect for kitchens & dining rooms. Slice is a specifier favorite; he glass housing and lighting quality are truly elegant; seeing is believing so contact us to book an appointment to see this amazing fixture in person. Replace several downlights with just one fixture since this fixture delivers up to 2900 lumens in the 11" version. Slice proves that budget friendly fixtures can still deliver! Great for living and bedroom and applications. The sculptural profile and satin brushed brass or nickel finish are graceful and restrained. Ideal for living, hall or bedroom applications. A curvaceous, stepped profile with luxurious styling that captivates, Rondelle features an intricate hardware combination in polished nickel. Three configurations are available for a myriad of residential and commercial applications. Perfect for modern bathrooms, as well as hallways, entryways and foyers. Combine a shades and decorative elements to create 14,560 unique designs. All combinations are ADA compliant. These fixtures have the same durable resin shades as the ALVA line, but feature the ability to add numbers, and elements that fit your design motif. 5 year warranty on complete fixture; easy, affordable, field replaceable led modules. 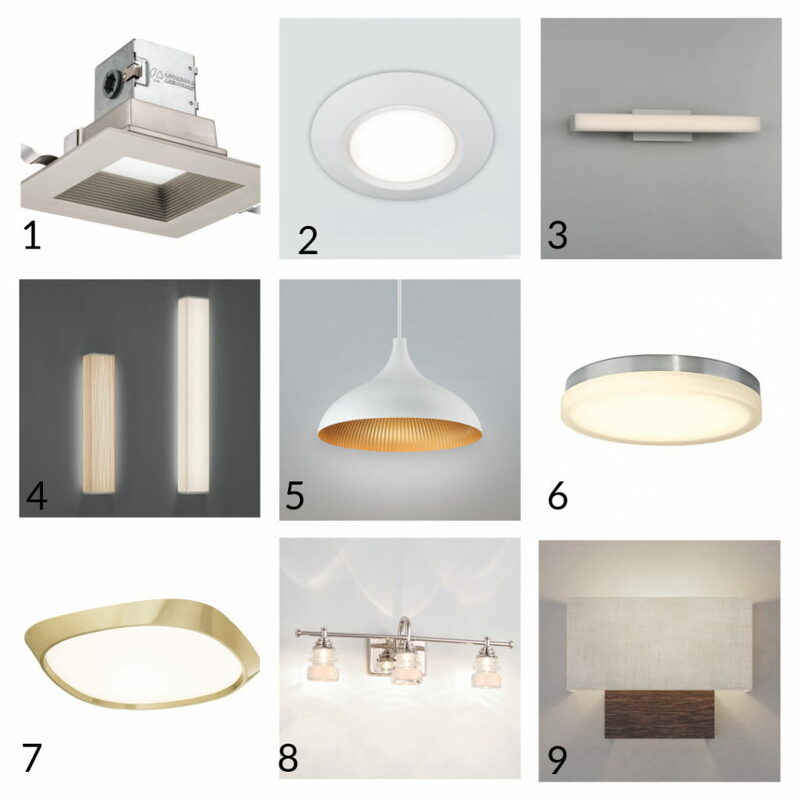 Sleek and simple the Alume numbered fixtures serves two important functions. It's ADA compliant and Wet Location Listed. The Slim Form downlight is extremely affordable, easy to install and highly versatile with round or square sizes up to 11 inches in diameter. It's mounted directly to a junction box; no can required! It's seriously slim at less than 1". It's modern form factor makes this affordable option one of 2018 popular. Hallways, living, bedrooms and bath applications. Elegant for lobbies and dining areas, Gilt's artisanal look is expressed in your choice of hand-leafed gold or silver which compliments the matt white or black exterior finish. The UCEL is Lithonia's most popular LED undercabinet fixture and provides a solution for both new construction and retrofits. This "Contractor Select" fixture come in 12, 24 and 36" versions. Available in square or retangular configurations, this beautiful fixture adds statement to common areas without breaking the budget! Modern Forms is offers best-in-class quality, providing affordable luxury. The Fidelux Stairwell fixture is Resource Lighting + Controls new star. It provides everything you'd want in a more expensive fixture such as a built in sensor that allows the fixture to turn off when the stair wells aren't occupied and options for emergency battery packs, but at very competitive pricing. Modernforms offers affordable modern elegance with all their pendants and features proprietary LEDs for best-in-class illumination, energy efficiency and endurance. Metric comes in three finishes: black, brushed aluminum, and brushed brass and can be specified from 28 to 48 inches. Disc is our "go to" wet location listed shower fixture for it's price and reliability. Another "Contractor Select" fixture, this fixture offers the extreme affordability and availability. It's often specified on projects with very low budgets because of its neutral, low profile form factor. Contractors find this fixture easy to install with hidden cam-latches for easy diffuser removal. At this pricing, the form options are limited but the quality is standout. You won't see any seems or veering lines; one-piece extruded aluminum housing ensures straighter rows and consistent lens retention. We've seen this specified for common areas and work-out and game rooms on multi-family projects. This innovative design with embedded quick connects allows contractors to cut at any length and reconnect in the field without soldering. Use under cabinets or anywhere you need long linear tape light runs.